Tucked into the ground floor of a grand palazzo on via San Niccolo is a traditional bottega (workshop). Through the gleaming glass shop front with Il Torchio engraved on the glass is a book and paper-lovers paradise waiting to be discovered. Sitting amongst antique wooden cabinets is shelving lined with leather bound books and pretty paper products all hand made; colourful marble effect paper, using traditions spanning hundred of years, hangs loosely over rails easy to peruse. Il Torchio is one of those unique finds in Florence one may expect from a city steeped with a history rich in creative traditions, a place where old techniques are still appreciated and used today. Here is a space half shop, half studio; an old heavy press sits in the center of the store while the main counter table has a cluster of works-in-progress by artisan Erin Ciulla. Erin first came to Florence in 2005 as a Postgraduate student from Ontario College of Art & Design. During her year abroad programme she focused on bookbinding, immersing herself in the traditional techniques Florence specialises in and to master her craft under the tutorage of Anna Anichini, the owner and maestro of Il Torchio. Returning to Canada after her year in Italy Erin felt life back home was 'lacking something'. 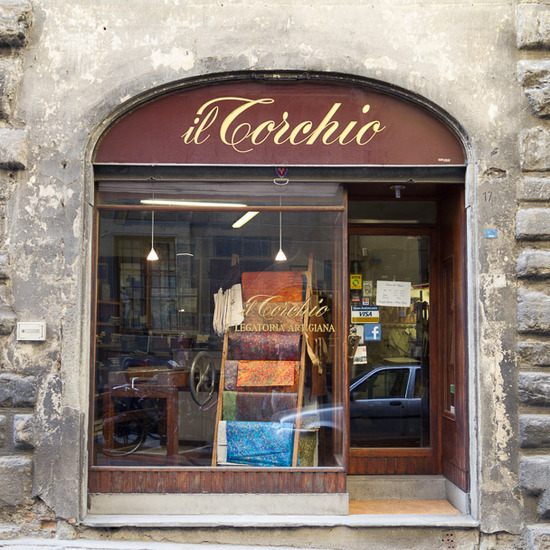 So in January 2007 she returned to Florence, and to Il Torchio, to fulfill her creative passion. When, in 2008, Anna retired, Erin took over the store, which has been at this location since 1980. Today she keeps the traditions alive working six days a week to make beautiful notebooks and paper plus bespoke items too. Erin can engrave personal notes for that special gift or creative something unique for a brand. Her piano notebooks are a favourite, with pencil used to hoist up the ‘piano’ lid, or a recent one-off commission saw Erin make a book cover with orange rind showing she is willing to experiment yet the traditional techniques remain the same. Il Torchio is an ideal store to find something unique for lovers of paper and notebooks, for writing or drawing, where all items are made with time and care. 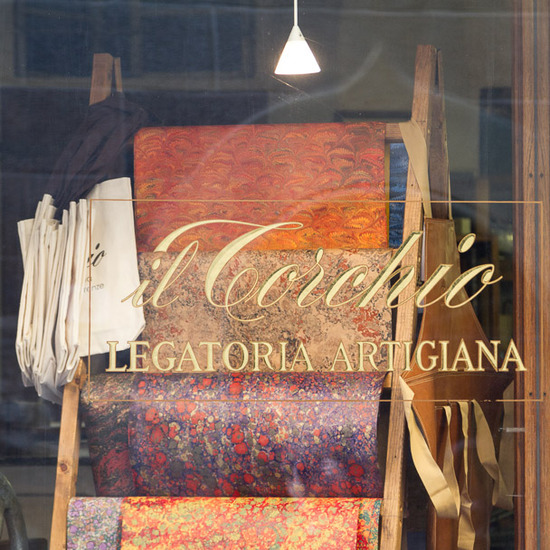 In this tiny little store down a medieval street in San Niccolo is a place to discover for gifts any time of year.